What About That Foreign Money? What does that foreign money look like? How do you know what it's worth? If you're an experienced traveler... you already know most of this. But if you're like us, you read everyone's tips anyway. Where do you change it? These are just things that we've learned through the years that have worked for us. Remember, things are always changing; we started traveling before there were ATMs and electronic tickets! The first thing we tell our friends about all valuables is to be safe with them. Nothing will ruin a trip faster than to lose your credit cards or travelers checks or cash. If you have paper tickets for the airline, think of them as cash too. The best way to safeguard all of these items is to wear a money belt or a security neck pouch. Except at the airport where we'll need tickets and passports, we keep cash, credit cards, passports and tickets tucked safely away in one of these. We personally use this belt style.... but either way, they keep things safe under your clothes. And don't say you'll put those foreign bills away later. Put cash away as soon as you exchange it. One of the times you may be most vulnerable is if you take public transportation into town, you're suffering from jet lag, and you're trying to juggle even your carry-on luggage... At that point, you're a prime target for a pick pocket, but if you have everything tucked away, hopefully all they'll get is your Kleenex. We recommend that you let your credit card companies know of your travel plans before departing. Some credit card companies require this to be done before extending credit to you away from home. This wasn't so necessary in the past, but it's more important all the time. We always inform the companies for international trips because we've had some identity theft and credit fraud incidents. If you haven't traveled much, and your credit card suddenly shows charges from London or Timbuktu, your bank could grow suspicious and freeze your credit..... Not a good thing...... especially in Timbuktu!!! We travel with only a couple of credit cards in addition to our ATM card. You don't want to have a whole pocket full of credit cards at risk. Mark and I carry different cards. Pick a couple each and leave the rest at home. Credit cards are accepted in more places all the time.... most now in fact. 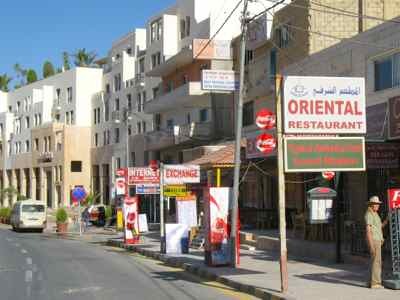 But there are still many little B&Bs that take only cash, some small restaurants too. And in some less developed countries you may find you need to pay in cash. And I think any time now, our US credit cards will finally have the chip and pin system. Your bank will charge you a transaction fee, so it's best to take out enough for a few days at a time. Ours only charges a couple of dollars per transaction, but you should check with your bank so you know what to expect. Some ATMs also charge a nominal transaction fee on their end. In our experience, we have only gotten the transaction fee from our bank... but that is changing too! It pays to get the equivalent of $200-300 instead of $20 at a time. But it is a balancing act.... try to figure out how much you think you will spend and only exchange that much. You will always lose money if you have to exchange your foreign currency back to dollars.... the banks make a profit on each exchange. Get A 4 Digit "PIN"
Make sure your "pin" will work abroad... it should be a 4 digit pin. This will be important for your credit card too as the US companies move to the "chip and pin" cards. We have a "PIN" for our credit cards too... and sometimes we need to put it in even without that chip. If at all possible..... Try to find ATMs that are in enclosed area instead of just open on the street. If you must use one on the street, make sure it appears safe. Be alert and aware of your surroundings just as you would using ATMs at home. Your ATM card has a cash limit per day. Remember what it is. If it's $300 you won't be able to get 300 Euros..... only about 250 Euros which at today's exchange rate is about $300. If you're changing to Kenyan Shillings on the other hand, you'll get KES 21,000. Just be sure you get the right number of zeros..... if you ask for 210,000 KES, the bank is sure to deny you as it did me. That was a little embarrassing since I was trying to show less traveled friends how easy it was, but I blamed the bad math on jet lag and on the second try, we had our money... no problem. As you can see, you'll have to figure out the exchange rate so you can calculate how much you want in local currency. Get a converter app on your phone... or you can get the exchange rate before you leave by checking online at a currency converter like OANDA. In the airport Arrivals Hall, there will almost always be a bank, and they will have conversion rates posted. 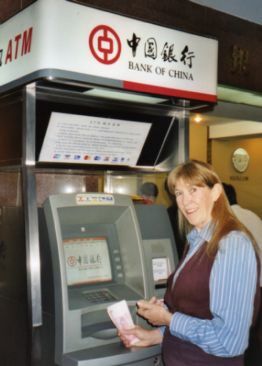 ATM's abroad have language options, so there will be one more step than you have getting money out of them at home. Put in your card, choose a language and follow the prompts. Money is usually only available in the local currency. One last thing on ATMs..... though they are almost everywhere, do make sure they will be available. We were in Belize a few years ago, and we were told there were no ATMs in Belize that honored US ATM cards. We think it must be true... at least we never found any. Hopefully that's changed now. Try to check ahead before you go to know whether to take cash, travelers checks, ATM or credit cards. We used to take a little of each. We haven't cashed our travelers checks in years, and we finally stopped carrying them. We had an interesting incident in Jordan. Our ATM wouldn't work due to a computer changeover at our banks, so now we carry two just in case. We had taken travelers checks... safe, right? Yes, safe, but none of the banks or hotels would cash them! We finally found a Western Union in Petra that cashed them for us, but at a very bad exchange rate! Some people will tell you to change some money before you go. We've never done that. There are almost always banks or money changers at the airport, and ATMs are everywhere.... well, almost everywhere.... remember what I said about Belize. Change money only at reputable or official locations. Black market money exchanges could get you in trouble at worst or be scams where you'll lose money. If you do exchange money at money exchangers, compare the exchange rates and commissions carefully. In the "old days" before ATMs, we often felt this was like comparing apples and oranges.... it was hard to tell where you could get the best conversion rate. ATMs are much more straight forward. Do try to familiarize yourself with the local currency so you don't fumble too much with it. It's best to do this in the privacy of your hotel room and not in public. You will fumble. Sometimes those little coins will be worth a dollar or two or five.... that 1,000 Kenyan Schilling bill will be worth $14.... so try to get a rough idea of what those coins and bills are worth. We've found that most people are helpful sorting out the right change, but you should always be on guard for a scam artist that might try to charge you too much because you don't figure out how much you're paying fast enough. Don't flash your money or carry wads of bills in your pocket. You're not going to impress anyone and you just might set yourself up for pickpockets. Keep enough money in your wallet for the day and put the rest in your money belt. You should avoid buying more foreign currency than you actually need. 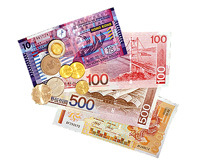 Some countries restrict the amount of currency they permit you to take when leaving the country. If you are traveling on a prepaid tour, you won't need to convert as much. Also, you may be able to pay bar bills at lodges and hotels in dollars or with your credit card. Read up in your guide book on tipping. This varies around the world and there are whole books written on it. Some places you aren't expected to tip at all. In countries where services charges are added to your restaurant bill, you need only leave a nominal tip by rounding up on the bill or 5% if any at all. If you're on a tour, find out from your tour operator what the customary tip is for guides and drivers. We don't pretend to be experts on this... in fact sometimes we're as confused about it as you are. If we really don't know, we will try to watch to see what the locals do, or talk to a local. It doesn't usually pay to ask the waiter himself.... most often you will get an answer like, "Whatever you please." Most Americans are used to tipping, so they don't want to discourage you. In developing countries, you don't want to over tip, but if there are three porters to carry your two small suitcases and your backpack, tip all three. The small amount you spend will help them greatly, and especially in national parks where animals are endangered, we want to locals to make a profit from tourism... In Rwanda we each paid a porter to carry our day packs when we went tracking gorillas.... Did we need them to carry these? No. But it was the right thing to do. Find out if locals prefer to be tipped only in local currency. Sometimes dollars are OK or are even preferred. In Africa we were passing out dollars to porters so often that we found ourselves running short.... a quick trip to the bar at the lodge and we had all the dollar bills we wanted.... even out in the middle of the bush! Just be careful with all of your valuables. 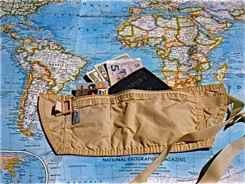 Wear that money belt.... Take your time paying at restaurants, in cabs, at souvenir shops. They all depend on tourists, and they will be patient. If someone tries to rush or pressure you, that's the time to beware. Most often we've had the lady in the pastry shop picking the right coins out of our hands and laughing with us. That foreign money may not be dollars and cents, but they're usually divided up similarly and with a little effort you will soon be making sense of them.